It's one crazy adventure after another in Cartoon Network's #1 hit comedy show and Emmy-nominated series. Follow the post-apocalyptic adventures of Finn (voiced by Jeremy Shada), a human boy with a funny hat, and his friend Jake (John DiMaggio), a magic and mischievous dog. They're out to have the most fun possible and they sure do find it exploring the Land of Ooo! Make sure to check out our reviews for 'Adventure Time: The Complete First Season' and 'Adventure Time: The Complete Second Season' as well! A title can say a lot about a show -- and 'Adventure Time' is no different. Those two simple words perfectly sum up exactly what audiences can expect from this wonderfully creative cartoon, serving as a straightforward mission statement for the entire series. Funny, exciting, and bursting with personality, the show's third season is every bit as delightful as its previous two, transporting viewers, young and old, into a magical world full of offbeat charm. As soon as that title hits the screen, there is no question about what's in store for us. After all, it's spelled out in plain English and bold letters right before our eyes. It's adventure time! Picking up where season two left off, the series focuses on a young boy, Finn (Jeremy Shada), and his magical dog, Jake (John DiMaggio). 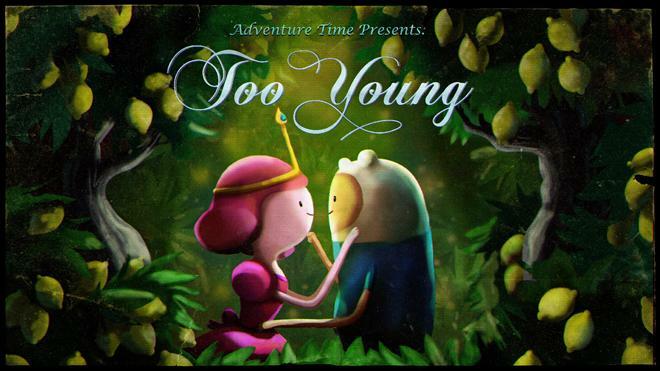 Each eleven minute episode follows the pair as they embark on new quests and misadventures in the post-apocalyptic land of Ooo. This includes repeated conflicts with the princess-stealing Ice King (Tom Kenny) and various team-ups with the rocker vampire Marceline (Olivia Olson) and Finn's royal crush Princess Bubblegum (Hynden Walch). Throughout the 26 episode third season, the writers come up with an imaginative array of new obstacles and scenarios to place our determined heroes in. Highlights include stories involving a wizard tournament (no science allowed! ), a haunted house mystery, a troublesome door lord, a kitten assassin, a dancing banana, and secret dungeons. Once again, the series plays around with standard role playing and fantasy tropes to create its own unique narrative style, and the show's trademark offbeat humor is back in full swing, filtering juvenile silliness through some of the sharpest writing on TV. Music also ends up playing a much larger role this year with characters frequently breaking out into song to express their feelings. The tunes and lyrics are all catchy, simple, and appropriately quirky, perfectly complementing the show's unique storytelling sensibilities. While the disc is packed with many great standalone episodic installments, the creators also continue to expand more upon the show's larger mythology in both subtle and major ways. Morsels about the characters' backstories and deeper relationships start to trickle out, and ongoing plot threads are developed more and more. Little hints about the history of Ooo are teased as well, and there are several seemingly insignificant details here that actually prove to be rather important in later seasons. 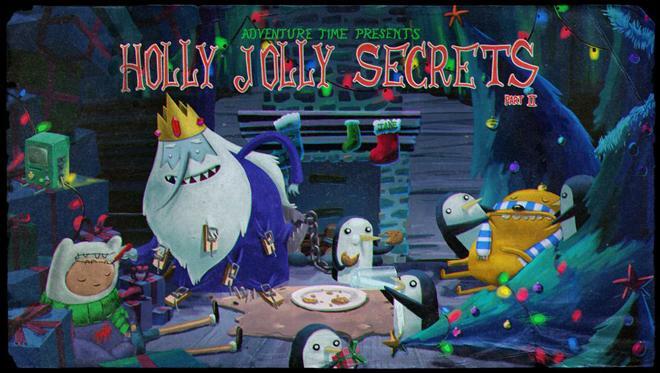 To this end, episode 20, titled "Holly Jolly Secrets Part II," becomes one of the series' most important and defining installments. It's here where we get our first glimpse at the Ice King's surprisingly tragic origin, exposing a slightly serious and melancholy tinge that will go on to inform future episodes. Along with more serialized elements, season three also sees the writers experiment a bit more with the show's usual format, leading to a few truly great stories that break from the standard mold. Episode nine, "Fionna and Cake" is a fan favorite installment that features alternate reality gender swapped versions of all of the characters, and this simple twist yields very fun and clever results. Of course, the real standout here is episode 17, titled "Thank You." 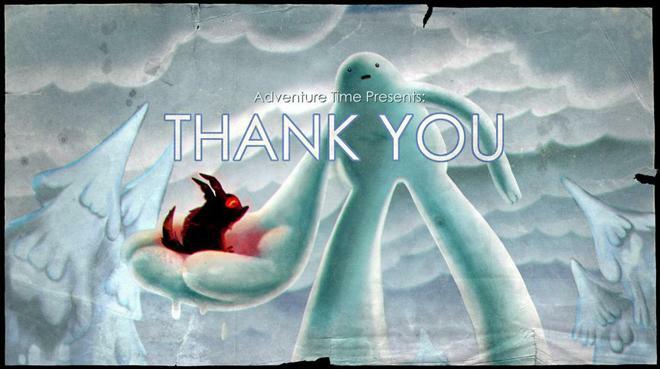 Instead of Finn and Jake, the story mostly focuses on a snow golem who tries to return a lost fire wolf to its family. Sweet and heartwarming, the episode actually feels like a standalone short film in the Pixar tradition -- and it turns out that Cartoon Network felt the same way. A slightly re-edited version was even shown at the Sundance Film Festival, and the piece really is a charming example of contemporary animation. 'Adventure Time: The Complete Third Season' is unlike any other cartoon on TV. Perfect for kids, parents, and anybody who enjoys absurd humor and exciting fantasy, the series continues to be one of the small screen's real gems. This batch of episodes is full of new wonders and offbeat silliness, and at its core the show maintains a unique sense of laidback charisma fueled by a big heart. Effortlessly entertaining and packed with exuberant joy, the series never fails to put a smile on my face, reinvigorating a childlike sense of magic, possibility and, of course… adventure! Warner Bros. brings 'Adventure Time: The Complete Third Season' to Blu-ray on a single BD-50 disc that comes housed in a keepcase with a cardboard slipcover. 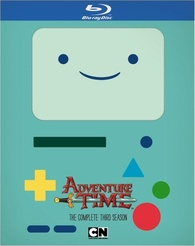 Much like the previous seasons, in a fun little design choice, the slipcover is shaped to look like BMO. When the slipcover is removed, the full cover art exposes the character's inner circuitry. A code for an UltraViolet digital copy is also included. After some skippable trailers, the screen transitions to a standard menu. The show is provided with a series of 1080p/VC-1 MPEG-4 transfers in the 1.78:1 aspect ratio. Like the previous two seasons, this is a very strong video presentation that beautifully renders the series' wonderful animation style. The digital source is mostly pristine and artifact free, but there is some negligible banding visible in isolated shots. The animation style isn't prone to many fine details, but clarity is sharp and crisp, with clearly defined lines, characters, objects, and backgrounds. Likewise, colors are bold, bright, and vibrant, bringing the land of Ooo to life with vivid personality. Contrast is also well balanced with stable whites and inky blacks that don't crush. Fans of the show who own the first and second seasons know exactly what to expect here, and this release does not disappoint. Clean and colorful, the transfers preserve the creators' unique animation style with no major issues. The series is presented with English Dolby Digital 2.0 audio along with optional English SDH subtitles. Sadly, just like the previous seasons, all we get here is a lossy mix -- but, on the bright side, the tracks remain rather engaging and lively for what they are. Dialogue is full and well prioritized throughout, highlighting all of the extremely talented cast's charming voice work. Effects are spread well across the two channels of audio, revealing pleasing imaging and directionality. Though the lack of a surround mix does limit the track's scope, action scenes are still nice and lively, sending sword slashes and magic spells to the left and right. Music also plays a large part in the series, and all of the quirky songs sound great. Dynamic range is hindered some by the lossy presentation, but there are no technical issues to report. A lossless 5.1 presentation would certainly be appreciated, but these Dolby Digital 2.0 tracks are still surprisingly engaging and energetic. It's not ideal, but the audio suits the series well. Commentaries – Commentaries are provided on all 26 episodes with creator Pen Ward and a cavalcade of story board artists including Rebecca Sugar, Kent Osborne, Cole Sanchez, and Adam Muto. The laidback group discusses their ambitions for season three while sharing anecdotes about the writing and storyboarding process. Details about deleted material and episode inspirations are also shared. It should be noted, however, that there is an odd bit where words are looped and repeated in a trippy echo effect every now and then throughout the tracks. These strange isntances seem to cover up spots where comments had to be cut out... or they're there just to be weird. It's one of those. Alternate Adventure Time Intro by Screen Novelties (HD, 1 min) – Presented in 1080p with Dolby Digital 2.0 sound, this a wonderful recreation of the show's opening animation done with legos. How an Idea becomes Adventure Time (HD, 8 min) – Presented in 1080p with Dolby Digital 2.0 sound, this is a discussion with the show's writers and storyboard artists about their approach to writing episodes. The relaxed and gracious group reveal that they create the show for themselves, and share stories about parents thanking them for making something that they can enjoy too. 'Adventure Time: The Complete Third Season' gives fans another collection of sweet, quirky, funny, exciting, and effortlessly entertaining episodes. Creative and wholly unique, the cartoon is much more than just your standard family entertainment fare, offering all-ages fun that never talks down to its audience. The video transfers are great, and while not lossless, the audio mixes are lively. Supplements include commentaries on all 26 episodes and a solid interview with the writers about their process. Along with the works of Pixar, the show continues to be one of the best examples of cartoon entertainment for all audiences. Highly recommended.